I teach high school. Which means that sometimes I am stuck in this never ending loop of homecomings, report cards, pep rallies and prom kings. Names, music and fashions change, but year after year so much is the same. One of the dress up days last week was college day, I played country music on Western day, a lot of Madonna and Micheal Jackson on 80s day….so on college day I figured I should play music I listened to in college. All day I spent a lot of time thinking about who I was in college. And frustrated that so much of me was exactly the same. Give or take 25 lbs. The same issues I had in my twenties is the exact same baggage I carry around today. I am oh so easily distracted. I hate limits and budgets and rules. I like cute boys and beer and things that are not always good for me. I play my music too loud. I still wear pajama pants and flip flops every chance I get. Even in public. If I am wearing actual pants...chances are good that they are not clean. I can not be trusted with a credit card. I lose my keys at least once a day. I could keep going with this list of the comical, yet negative self-talk that filled my head for a good portion of the day while Dave Matthews and Sarah McLaughlin sang on my computer. I was not proud of this lack of progress in my life. I mean, I thought I would have a few more things figured out by the time I made it this far. Or at least used my iron or vacuum cleaner a little more regularly. And then I had to go and read this. Oh…how I love Don Miller. Blue Like Jazz and Searching for God Knows What rocked my world. And in some ways I have a love/hate relationship with the old me. The 10 year ago me is older than the college me….but it made me think about who she was. I always tell people that 26 is the perfect age. Not so broke. Not so new professionally, but still free to be young and stupid. The only thing I had to think about when I wanted to go on a last minute weekend trip was who would keep my dog. The same house I have now. I had 5-6 great friends. They are still some of my favorite friends. A cute husband who I could count on. The same one who did all the laundry and cooked dinner yesterday. And he is still cute. Some things are worth keeping. Many days I envy that 26 year old. Especially the one that shouldn’t be on cholesterol medicine, anti-seizure meds and has trouble staying awake past 10 o’clock. But you couldn’t pay me to go back. I might still be able to recognize the 26 year old me….but the changes have not just been bigger pant sizes, booster seats and better health insurance. I have grown comfortable with questions and doubts and laying it all on the table. I do lots of things that I am afraid of that a decade ago I wouldn't have dreamed of. I’ve even kind of grown a little fond of that nervous petrified feeling. I am teensy bit better at discerning when to hold on and when to let go. I can cook things I couldn’t even pronounce a decade ago. I can change a diaper, pack a lunch in less than a minute and have managed to figure out the pick up line. Two entire human beings have grown inside me and I have managed to somehow keep them alive for the better part of this decade. I even occasionally think before I speak. (clearly there is still some room for improvement here). My issues are still my issues. On most days my socks still don’t match. I still make a mean mix tape. And talk to people that I talked to a decade ago. And I’m so glad for it. Heck, some of my t-shirts are even more than 10 years old. But there is a lot of new too. My passport has a few more stamps. My contact list, my resume and my driving record have all gotten longer. My hair has changed shades at least a dozen times. And my heart has stretched and broken and been put back together more times than I can count. I haven’t figured it out. 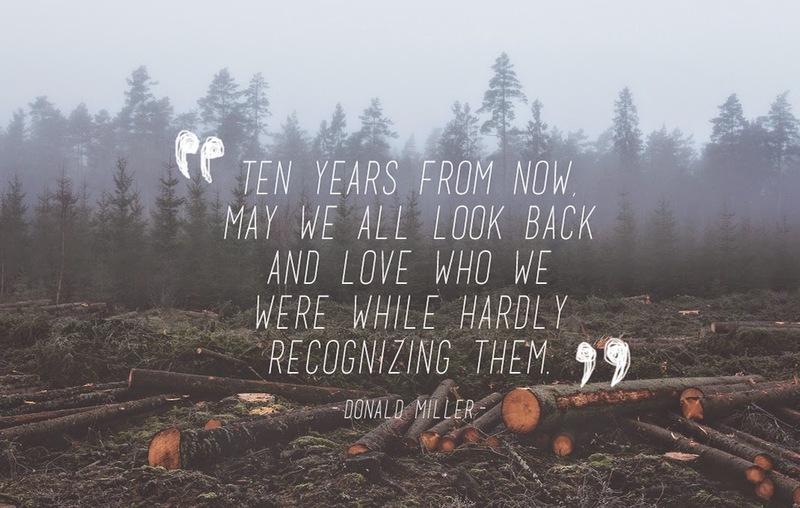 And I hope to God that I won’t be able to say that I have in another ten years. I never want to get there. And I’m not so sure that I even want to forget where I have been. Even the really hard ugly parts that I am not so proud of. I want to be different. But not so different that you can't recognize me. Some of my best parts are pieces I picked up when I was 16. And 26. And a month ago. Growth doesn’t necessarily mean we become someone else. It doesn’t mean we figure it out or arrive. It just means we are heading somewhere. Maybe it is knowing what to keep, what to loosen my grip on and what to keep struggling with. Maybe in the next decade I will master the vacuum.